Would you like to add a donation to your order? This week, our Monday motivation was this incredible footage of orangutan Max with her infant Monti, sent by our staff who are as excited about this new addition as we are. However, the next day, we heard from our Patrol Manager, Jakir, that fires were once again raging close to the Lamandau Wildlife Reserve, Indonesian Borneo. One moment we are celebrating new life, the next we are battling to save the habitat. Thankfully the wildlife reserve is 158,000 acres in size and the fires are well away from the orangutan release camps. Our 8 manned guard posts, around the reserve, means our patrol staff can respond quickly to keep the reserve safe and prevent the fires from spreading. Habitat protection is our priority. Please donate to our appeal to help us keep forests standing and orangutans in the wild. International Orangutan Day (19th August) aims to increase global awareness about orangutans and their tropical forest habitat. This weekend, Orangutan Foundation, in Central Kalimantan, orangutan capital of the world, have a festival of activities arranged for hundreds of people. Members of the youth groups, Kalteng Indonesian Conservation Cadre Communication Forum (FK3I) and the Student Nature Lovers, throughout Kowaringin Barat Regency will join in. We’ll be celebrating orangutans and conservation with overnight camping and art activities. Five local kindergartens are taking part in a colouring contest. We’ve also organised a car-free day in the town of Pangkalan Bun to highlight this global day celebrating orangutans. Ensuring awareness is achieved here, means that a real difference can be made. The overall aim is to increase community awareness about the environment and the presence of wild orangutans in the surrounding forests. Leaflets will be distributed informing people how to avoid human-orangutan conflicts. This action is needed more now, than ever before. Watch this space for news and images of how the festivities went. We only send out appeals when there is a real need for help – and right now, we urgently need funds to strengthen the protection of the Lamandau Wildlife Reserve, habitat of the critically endangered orangutan. In January and February, our forest patrol staff detected and tackled fires, deliberately lit to clear land, next to the reserve. They prevented the fires from spreading and saved thousands of acres of peat swamp forest from going up in smoke. In March, we met with the provincial government to push for those responsible for starting the fires, to be held to account. The Lamandau Wildlife Reserve totals 158,144 acres of tropical forest. The Foundation's staff put themselves at risk as they battled to protect the forests, home to a population of 500 orangutans. Half of these were reintroduced or translocated by the Orangutan Foundation and given a second chance of survival in the wild. We must make sure they are safe. It costs a quarter of a million pounds a year to protect the reserve and the wildlife. A significant commitment for a small charity, but a relatively small amount considering the invaluable riches and services the forests contain and provide. The Orangutan Foundation runs and staffs eight guard posts in and around Lamandau to deter and prevent access to the forests. Our staff, all committed local Indonesian conservationists, patrol on foot or by boat. We use conservation drones and GIS to map and document illegal activities. The map below shows the guard posts (red triangle on blue). In 2017, we stopped illegal mining inside the reserve and since the beginning of 2018, our forest patrols have detected and stopped two cases of illegal logging. Yet, despite years of investment in successful community awareness, there remain a small few who want to exploit the forest for their own interests. As pressure for land increases our fight to protect standing forest, to stop it being logged or converted to oil palm, will only become more difficult. Protecting Lamandau is an ongoing commitment: we cannot temporarily close a guard post due to insufficient funds, in the hope that we might start up again next year. If we stop protecting the reserve, we know that we will lose it: the forest and its precious wildlife could be gone in an instant. Bangkal is one of the orangutans at risk. Originally released into the neighbouring Tanjung Puting National Park, Bangkal was severely injured in 2000 when illegal loggers attacked him with boiling-hot oil. Following a long period of recovery, he was released into Lamandau, at Camp Gemini, one of our five release camps in the reserve. Bangkal, now strong, healthy and independent, has since become the dominant male.Aan, an adult female, was shot and permanently blinded in an oil-palm plantation. Foundation staff moved Aan to the Lamandau Reserve, where she now lives with round-the-clock monitoring by our staff and vet. We also care for ten orphaned infant orangutans at our release camps - plus many dozens of reintroduced and translocated adults that are thriving in the wild under our protection. We owe it to these orangutans to keep their forest home safe. Please DONATE SECURELY THROUGH OUR WEBSITE, by calling 020 7724 2912, or by sending a cheque payable to ‘Orangutan Foundation’ to Orangutan Foundation, 7 Kent Terrace, London, NW1 4RP. If you are unable to donate immediately but want to make funding pledge, whether through fundraising or a delayed donation, please contact us to discuss options – we will work with you however we can. We must act today to secure the future for orangutans, forests and people. Fires, deliberately lit next to an oil-palm plantation, have spread to the Lamandau Wildlife Reserve, home to over 500 critically endangered orangutans. This is the second fire this year. Please donate to help us. The Orangutan Foundation's guard post staff spent yesterday evening and all last night fighting the fires. We can't thank them enough for their bravery and efforts to protect the Wildlife Reserve. The fire, as the map below shows, was on the other side from our Orangutan Release Camps and so our young orphaned orangutans and Aan, the blind orangutan, are safe. However, other wild orangutans and species will have been harmed by these fires. We are alarmed that fires have been lit in the first place but are spreading so easily, especially at this time of the year. It is meant to be the wet season but the scrub land, just bordering the reserve, and the forest, inside the reserve, is unusually dry due to lack of rain. In 2015, an El Nino year, over 11,000 hectares of the reserve burnt. This cannot happen again. At around 18.00 hrs yesterday our guard post staff at Post Vigilant Howe detected fires about 3 km outside the boundary of the Lamandau Wildlife Reserve. 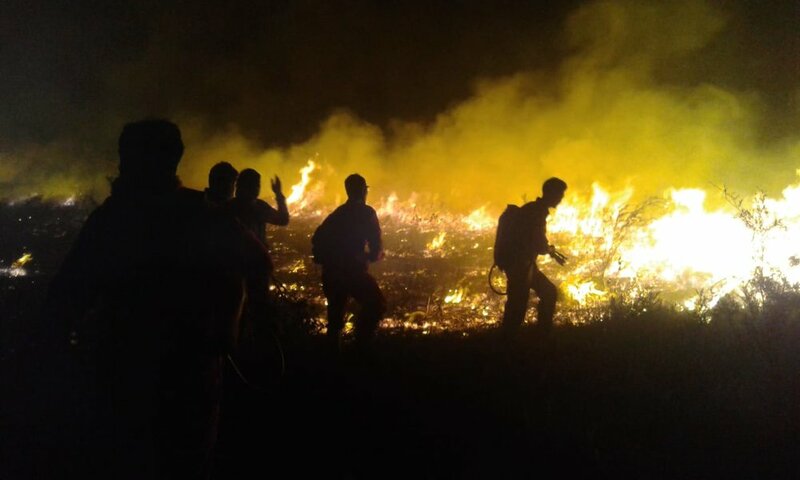 The fires are thought to have started near to PT Sampurna oil-palm plantation. Our staff from Guard Post Danau Burung and Government Resort staff BKSDA SKW II from Guard Post Sungai Pasir tried to extinguish the fires for 3 hours using water jet pack shooters. At 20.00hrs they realised the fire was growing due to the wind and ready fuel of dried shrubs and grass. They informed the Head of BKSDA Resort SKW II, Mr. Sugih Trianto and requested extra help. Our staff from Guard Post Perapat and even our Forest Restoration Manager, Anto, went to help tackle the fires. At around 03.00hrs the fire was eventually extinguished by an exhausted team, made up of Orangutan Foundation and staff of BKSDA SKW II. At 10.00 hrs today our team returned to the location of the fire and extinguished any smouldering vegetation. The fires were very close to our Guard Post Vigilant Howe. Using GPS, the total area of the fire was 61 hectares, which is the equivalent to the area of 150 football pitches. Our Vet, Dr Dimas, has been treating one of the young orangutans in our Soft Release Programme for a dry scalp. Dimas, has been applying a moisturising ointment and our staff will continue with this treatment. All our young orphaned orangutans were also given vitamins and medication to prevent parasitic worm infections. While going from Camp Siswoyo to Camp JL within the Lamandau Wildlife Reserve, Dr Dimas and Azhari (Orangutan Reintroduction Manager) had to use a kelotok boat (flat bottomed) instead of a speedboat because the water level is getting lower. The dry season seems to have come early this year to Central Kalimantan, with very little rain. There are worrying reports of more fires, right on the boundary of the Reserve. We'll keep you updated on this situation. Please click here to donate to our work. In the last month we have heard disturbing reports about the cruel and brutal killing of two critically endangered Bornean orangutans. Sadly, our staff care for the victims, of these sort of actions, every day. We're still caring for Aan, shot 104 times and left permanently blind. Little Bumi, rescued last year, 8 pellets removed, his mother must have been shot and killed. We ask ourselves, how could someone harm these gentle, intelligent and peaceful beings? The killing of an orangutan is a visible threat, rightly generating shock and outrage. The invisible threat that forces orangutans into increasing contact with humans, onto oil-palm plantations or village farms, is habitat loss. We use the term invisible because habitat loss does not elicit the same level of response as an orangutan killing. In the last month our guard post staff have tackled illegally lit fires and prevented them spreading, but still 30 hectares burnt. This week, they detected the second case this year of illegal logging, right on the boundary of the Lamandau Wildlife Reserve. This is meant to be strictly protected forest, it has a population of over 500 orangutans. We need to keep it protected and the orangutans safe. Why does the image of a fallen tree not also generate the same outrage? When forests are cleared, orangutans and hundreds of other species are harmed or even killed. Some survive, if they can move to another area of forest. This increases competition for resources and forces them into closer contact with humans. It is because we can’t see the immediate impact on orangutans and so our response is different. We need your help now, more than ever. Our guard post patrol staff require ongoing support to prevent illegal activities and further loss of orangutan habitat. The Lamandau Wildlife Reserve is huge, 158,144 acres of tropical forest (one acre is the approximate size of one football pitch). Our staff do a fabulous job patrolling such a large area but need to be supported. Please help us to keep these vital forests standing and their precious inhabitants in wild. Please donate today. If you can, please consider becoming a Guardian of Lamandau Wildlife Reserve, from £16.50 a month (the equivalent of 55p a day) you can make a significant difference. Thank you. We thank the West Kotawaringin Police, KPHP Kotawaringin Barat, and BKSDA Kalteng for their joint patrols. The Orangutan Foundation is delighted to welcome Dimas Yuzrifar as its new vet, replacing Dr Steven, who has now returned to Bali. Being "thrown in at the deep end" is certainly how the first week has been for Dr Dimas! Last weekend we received reports of a wild orangutan in village forest. This was passed onto the government agency for wildlife, BKSDA SKW II Pangkalan Bun. The orangutan was found close to oil palm, banana and rubber plantations owned by local residents. The villagers feared the orangutan would damage their crops and so BKSDA decided, in this case, to capture and move (translocate) the orangutan, to avoid any conflict arising. Dr Dimas managed to anesthetize the orangutan. After being caught the orangutan was identified as female with an estimated weight of around 25 kg. The next day after checking the orangutan was well and active she was released into the safety of the protected Lamandau Willdife Reserve. Watch this clip to see how quickly the orangutan leaves the transport cage and disappears into the forest. After the busy weekend with the translocation, Dr Dimas also spent time meeting and checking up on the young orangutans in our release camps. Here's a clip of young Satria playing in his night-time enclosure. Wonder what the next week will have in store? Donate to help us keep the Lamandau Wildlife Reserve and its precious orangutans and wildlife protected. Click here to donate - thank you. Here is a snapshot of the Orangutan Foundation’s year in the field, thanks to our dedicated Indonesian staff. Most importantly, thank you for your ongoing support. We truly could not do, what we do, without you. January: Miners evicted from the Lamandau Wildlife Reserve and mining equipment confiscated. February: Attempts to restore sight to blind orangutan Aan sadly fail but her story galvanises support for her cause. We continue to care for Aan to ensure she has the best quality of life possible. March: Infant orphans, Mona (top) and Nyunyu (below), are rescued and enter our Soft Release Programme, bringing it to 10 young orangutans being cared for. April: Orangutan Foundation, active on Earth Day, involving young Indonesian’s in cleaning up rubbish in their local environment. May: Publication of our new photo book promotes the wonders of the orangutan’s world and raises vital funds for forest restoration. June: A new orangutan birth in Lamandau Wildlife Reserve. Venty shows off her new baby, Volvo. July: Another birth! Dedek gives birth to a healthy baby, named Dublin. Orangutans Jessica and Ketty, are released back to the wild! August: Orangutan Foundation staff help tackle fires and stop them spreading to the Lamandau Wildlife Reserve. September: Orangutan Foundation Patrols in Tanjung Puting National Park remove and destroy illegal fishing traps, which also pose a threat to other wildlife species. October: Bangkal, an ex-captive rehabilitated orangutan, reminds all who is King of Lamandau! December: A wild female orangutan is rescued from a beach resort and translocated to the safety of the Lamandau Wildlife Reserve. And to finish off our year here's Adib, the latest orphan orangutan to join us in November, making his first climb at Camp JL, in the Lamandau Wildlife Reserve. “As the pictures came through on WhatsApp and I saw an image of a beach I wondered what our rescue team had been up to!” - Ashley Leiman (Orangutan Foundation director.) A lone adult orangutan had been reported close to a beach resort where villagers were threatening to capture and harm it. After receiving the call for help from the Wildlife Department (BKSDA SKW II), in Central Kalimantan, Indonesian Borneo, our vet and rescue staff had to drive, for 5 hours, through the night, to the town of Sampit. The team made a rescue plan and set off at 3am to where the orangutan was last seen. They found the orangutan’s nest and traces of faeces, but the orangutan was nowhere to be seen. After 10 hours of searching, the orangutan was finally spotted in a small patch of mangrove forest. No wanting to lose her again, Orangutan Foundation’s vet had a dart gun ready. The orangutan was successfully darted, caught and then quickly examined by the vet for injuries. Our vet gave her another examination and confirmed she was female, healthy and in a fit condition. He gave her vitamins and worming medicine and blood samples were taken. She was then transferred into a holding cage, for the long drive back to Pangkalan Bun, to the Wildlife Department’s head office. Bornean orangutans are critically endangered due to the destruction and fragmentation of tropical forests. As they lose their forest home they are forced into contact with humans, often resulting in injury or death for the great ape. We have rescued many orangutans, but this is the first time an orangutan has been rescued from a nearby beach. Luckily, for this orangutan, she was taken by boat to the protected Lamandau Wildlife Reserve. As soon as the cage door was opened she clambered straight up the nearest tree and disappeared into the forest canopy. The wildlife reserve, is home to an estimated 500 orangutans, and the Orangutan Foundation actively protects it with guard posts, forest patrols and conservation drones. Please donate now to support our work. From 28th November until 5th December you can DOUBLE your donation through the Big Give Christmas Challenge, at no extra cost to yourself. Click here to donate and double your impact to support our work. This year our we are raising funds to inspire Borneo’s future conservationists. In this clip Arie, Research Manager of Pondok Ambung, our tropical forest research station in Tanjung Puting National Park, explains why it is important. We use camera traps to monitor the wildlife in the forests surrounding Pondok Ambung. Watch this short clip to see some of the species we’ve managed to capture on film! To protect Indonesia’s biodiversity, future conservationists need to be encouraged and supported. Please help us to ensure a future for orangutans, forests and people. Thank you for your support. Click here to DOUBLE YOUR DONATION through the BIG GIVE. To finish off Orangutan Awareness Week, our final blog post is about Jakir, who oversees the protection of the Lamandau Wildlife Reserve and its precious inhabitants. He has been in this role for 10 years. Jakir is also a talented photographer and many of his images have been included in our new photobook, The Orangutan's World. Our committed Indonesian staff are the bedrock of all we do. Please donate to support our vital work, keeping forests standing and orangutans in the wild. My role as Patrol Manager is to supervise the 12 staff who occupy our eight guard posts, ensuring that they are well maintained and operated, so that the wildlife reserves are protected from illegal activities, such as logging, mining, hunting and fishing. It’s a very important role and I most of all I love the interaction with the local community in the field. Sometimes ignorance is the reason for illegal activities, and we tell people what we are doing so they also understand why we are protecting the forest. But the biggest challenge is facing people who deliberately do illegal activities. We have faced threats and bribes, but some people who were previously involved in illegal forestry now give us information on illegal activities they encounter. It’s very special to see some of the animals that we have saved roaming free in the forest in Lamandau. When I first met Ashley, the Director of the Orangutan Foundation, I didn’t understand why she talked so much about protecting the forest and sacrificed so much of her own time for this. But a long time afterwards I saw some villages submerged by flooding and I realised why protecting the forest is so important. My hope is that the forest will always be alive and awake, so that my grandchildren can see and feel the coolness of this forest. Written by Anna Levin, this interview was featured in our latest member's newsletter, Red Ape, Autumn 2017. By donating £16.50 a month you can become a Guardian of the Lamandau Wildlife Reserve and support the protection of over 150,000 acres of tropical forest habitat. Click here to find out more. Aan is a blind orangutan. She first came to us in 2012, having been found stranded on an oil-palm plantation, after being shot over 100 times with an air gun. The injuries sustained left Aan blind. You can read more about her rescue here. In 2016, we arranged for an ophthalmic surgeon to visit Aan to see if there was any chance of restoring her sight, with the hope that one day she could return to the wild. Aan underwent surgery but it soon became clear that the damage sustained was too severe and Aan would be permanantly blind. Aan lives in a purpose-built enclosure at Camp Gemini, where our vet clinic is located, in the Lamandau Wildlife Reserve. Our staff give her the best quality of life that is possible, but sadly Aan can never return to the forest, where she belongs. Aan’s story serves as a heartbreaking reminder that the threat to orangutans caused by habitat loss is a very real one. Please support our care of Aan during Orangutan Awareness Week by donating here. Kotim was rescued in 2014. She was handed over to Orangutan Foundation after being illegally kept as pet. Sadly, we can only assume that her mother was killed. At three-years-old Kotim was too young to be released back into the wild and so entered into the care of our Soft-Release Programme, at Camp Rasak in the Lamandau Wildlife Reserve, Indonesian Borneo. Kotim joined another infant orphan, Torup. They became playmates and together practised their nest-building and climbing skills. By April 2016, Kotim was deemed to have all the skills needed to survive in the forest and was successfully released. She is still occasionally seen by Orangutan Foundation staff. In December 2016, Kotim was seen with adult female orangutan Acuy and her infant, Ariel. Support Kotim during Orangutan Awareness Week. Please donate to help us protect her tropical forest home. Keep forests standing and orangutans in the wild. In the late 1980’s Bangkal was an orphaned infant, being kept as a pet. He was rescued, rehabilitated over many years, and then released into Tanjung Puting National Park, Central Kalimantan Indonesian Borneo. In 2000, when illegal logging was rife in Indonesia’s National Parks, Bangkal became the victim of a horrifying incident. Illegal loggers threw hot oil over him resulting in a burn down his face and neck. During his recovery, Bangkal protected himself from annoying insects, by using a blanket to cover his injured face. Once recovered, Bangkal was released again but this time into the Lamandau Wildlife Reserve. Now aged around 28 years-old, cheek-padded Bangkal is magnificent. He is the dominant male around Camp Gemini and is thought to have fathered many offspring. Support Bangkal during Orangutan Awareness Week! Please donate here to help us protect Bangkal in his forest home. Holahonolulu is a wild born adult female orangutan. Her mother, Huber, was released into the Lamandau Wildlife Reserve in around 2000 and Holahonolulu was born in 2004. Huber unfortunately passed away in 2012. Holahonolulu is often seen by Orangutan Foundation staff at the feeding station, close to Camp Gemini. She been observed with Bangkal, a dominant male, mating on several occasions. Orangutans have a gestation period of about 9 months, it is slightly shorter than humans. Watch this space for the announcement of a new arrival in a few months’ time! We are delighted when released orangutans go on to produce future generations. The orangutans of Lamandau Wildlife Reserve are now a healthy, viable and growing population. Support Holahonolulu during Orangutan Awareness Week here! Please donate to help us protect her tropical forest home. Yesterday brought the extraordinary news that a new orangutan species in Sumatra has been officially recognised by a group of scientists (for full paper, click here). The Tapanuli orangutan (Pongo tapanuliensis) has been found in the Batang Toru Ecosystem of North Sumatra, Indonesia. Until recently these orangutans were thought to belong to the genus Pongo abelii, also known as the Sumatran orangutan. However, research has revealed that genetically, these orangutans are more closely related to Pongo pygmaeus, the Bornean orangutan, but remain distinct enough to be classed as an entirely new species. Other differences which have been recorded include their diet, skeletal structure, and hair, which is thicker and frizzier than that of the Bornean or Sumatran orangutan. Sadly, despite being the newest species of great ape known to science, they have immediately been classified as critically endangered, with only 800 individuals thought to exist in the wild. Their only threat is habitat loss. The Tapanuli orangutan’s range is already fragmented across three areas of forest. Additionally the area is threatened with the proposal for construction of a new hydrodam. Therefore, we must ensure further loss of their forest habitat is prevented. Visit http://www.batangtoru.org/ for further information and to help this new species. People's Trust for Endangered Species (PTES) have been supporting the Orangutan Foundation's work in Indonesian Borneo for a number of years. We would like to share this Q & A with PTES and our Indonesian Programme Manager, Ade Soeharso, as part of the launch of their new appeal to save orangutan habitat. Orangutan expert and Programme Manager at the Orangutan Foundation, Dr Ade Soeharso, answers some questions about the lives of orangutans, the dangers they are facing and ways anyone can save them now. When did you start working at the Orangutan Foundation? I’ve been a partner of the Orangutan Foundation since 2006. I was still working for the government then. Between 2008-2014 I worked part-time as a technical advisor of the Orangutan Foundation, and since 2015 I’ve worked full-time for the Orangutan Foundation. What is the ideal habitat for an orangutan? The ideal orangutan habitat is a mixture of swamp forest, lowland dry forest, and mountain forest. Ideally the habitat would be undisturbed and have an abundance of trees for food and nesting. What is a protected forest? In Indonesia, a protected forest is a one where the underlying area is protected from being logged or converted to other uses by land clearing. What is palm oil? Why is the production of it so destructive? Palm oil is a vegetable fat produced from oil-palm fruit. Almost all food products and many other common items use palm oil as a raw material. Therefore, palm oil is produced in large quantities because there is a huge market. Unfortunately, production of palm oil requires very large areas and which is achieved by cutting down large numbers of trees, which we call forest conversion and land clearing. What have you found the hardest thing about working on the project so far? The conservation of forests and the animals that depend on them is still often seen as less important than economic and development issues. It is challenging to mobilize the support of the parties in forest conservation efforts. What is causing conflict between wildlife and the human population? Due to deforestation, the amount of wildlife habitat left is ever decreasing. This means that the potential conflict between humans and orangutans will only increase. Orangutans and many other animals such as crocodiles, bears, and monkeys are forced out of the degraded forest and end up in community settlements and plantations in search of food. Seen as pests, they are often shot. We make sure that where possible, wild animals are translocated back into safe habitat. This is only possible if there is safe habitat left to move them back to. What do you enjoy most about working with orangutans? I enjoy it so much when I could see orangutans who have been rescued and then released growing and thriving in well-preserved habitat, successfully raising families of their own. What time do you have to get up in the morning? Are orangutans early risers? I get up early at 5:30 am. In the forest, orangutans rise between 5:00-5.30 am and leave their nests to set off in search of food. How do you manage not to get lost in the forest when you’re following apes? Basically, when following apes we’re never alone. There are always at least two people. As well as helping record data and times, they are locals who are more familiar with the forests so that we don’t get lost. How many orangutans have you and your colleagues saved recently? In 2017, so far we have saved 14 orangutans. Some of them have been released already as they are mature and well enough. The others are in the soft release programme. They are taken out into the forest each day to practice feeding and climbing until they have mastered the basic skills and are ready to be released. Are you optimistic about the future for orangutans? I am optimistic that orangutans can still be saved as long as we focus on saving their forests that are an integral part of their lives. What must happen to ensure their survival? We have to encourage the creation of sustainable oil-palm plantations and stop forest conversion in orangutan habitat and prevent the occurrence of forest fires. We also have to ensure that law enforcement act so that no more orangutans are traded as pets. What can our supporters do to help? As well as donating to this project, if you are buying a product that is made using palm oil, look out for ‘sustainable palm oil’ on the label. Currently, the global area already being used for oil palm production is sufficient to meet our needs without any further loss of forest. It is possible for us to use oil-palm produced from sustainable palm oil plantations and it is something we can all to do. Please help us to help orangutans today so that they are still here tomorrow. We have received this footage from our field staff, of the rescue and release of an adult male orangutan, victim of habitat loss, found stranded in a narrow strip of forest between a village and oil-palm plantation. Fantastic teamwork by everyone involved meant that this rescue was carried out safely, and the male orangutan was able to be released in the Lamandau Wildlife Reserve just two days later, in an area of protected forest habitat. Help us to protect this forest reserve and ensure a future for orangutans, forests and people. Click here for more information. On Monday, 28th August 2017, Orangutan Foundation together with the local wildlife authority, managed to rescue an orangutan, found stranded in a forested area between a village and an oil-palm plantation in Central Kalimantan. The orangutan, an adult male of around 17 years of age, only weighed 80kg - about two thirds its expected weight.. The alarm was raised by one of the villagers, who, seeing the orangutan so close by, was worried the orangutan would destroy his oil-palm plantation, and even enter his own home. The challenging terrain made it difficult to reach the orangutan. The team had to use a boat to approach the area and then walk about 1km through swamp forest. On arrival, the orangutan was anesthetized to take it to a point of safety. This rescue highlights the problem of habitat loss resulting in more wildlife coming into human contact, leading to human-wildlife conflict. The orangutan will be examined by the Orangutan Foundation’s vet, and then translocated into the Lamandau Wildlife Reserve, a protected area on 30th August. To date, 15 orangutans have been rescued in 2017, some being immediately translocated and others, too young for release, will go into the Foundation’s Soft-Release Programme. Please donate to support our rescue and release programme. We would like to share this post written by Justin Wateridge, Managing Director of Steppes Travel. On Thursday many young people - perhaps a child, grandchild, niece or nephew of yours - received their A level results, but what does the future hold for them? Perhaps not one with pongo pygmaeus. To you and me that is the Bornean orangutan which is now feared to have less than 50,000 individuals and hence last year it was listed as Critically Endangered on the IUCN Red List of Threatened Species, the highest risk category. We hear much in the news about elephant ivory, rhino horn and the hunting of lions but little or nothing of the enigmatic man of the forest. Yet every year orangutan populations are threatened because of their habitat, low-lying tropical rainforest, is being destroyed and converted to oil palm plantations. Orangutans and the majority of biodiversity supported by tropical rainforests cannot co-exist with oil palm plantations. The use of fire to clear land for plantations is an additional risk to an already serious threat. An encroaching human population is adding to the orangutans' habitat loss. Last year the Orangutan Foundation rescued many more threatened animals than they have before - only half of these were orangutans, the rest were a diverse range of forest creatures including sun bears, leopard cats and slow loris. Having just come back from Indonesian Borneo, I met with the inspiring Ashley Leiman on Wednesday to see what more Steppes Travel could do to support the Orangutan Foundation UK the only one of six orangutan agencies in the UK that has permanent projects of the ground. Given that today is International World Orangutan Day I would urge you to think about what you can do to help, either directly via the Orangutan Foundation's website or better still by travelling with your family as I did to see orangutans in situ or join our revamped Orangutan Conservation tour. Yes you can see orangutans in this country but only in a handful of zoos - Blackpool, Chester, Colchester, Durrell and Twycross and we believe there is no substitute for doing so in the wild. Participants of the Steppes Travel Borneo group tour will be joined by an expert from the Orangutan Foundation, offering exclusive insight into our conservation projects taking place in Central Kalimantan. Alternatively, you can support our Forest Restoration Programme in Indonesian Borneo by purchasing a copy of our book: "The Orangutan's World". This wonderful book provides a glimpse into the world of the orangutan through a collection of photographs of the flora and fauna found in Indonesian Borneo. ©2018 Orangutan Foundation. All rights reserved.